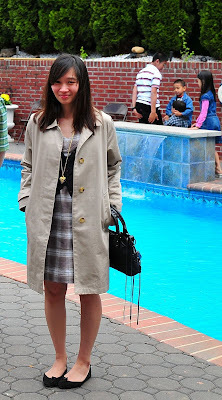 This is what I wore last Saturday. We were invited over to lunch at a friend's house. It was very spring-y so I decided to shave my legs and wear a dress! Hahaha! The weather was just right, sunny but with a bit of chill in the air. By 4 pm, it started to get a lot cooler so I had to wear a light jersey scarf around my neck. you have the balenciaga bag!!!! i am in love with that bag.. if i see one at a descent price i'm gonna get it and throw away all my bags..
sorry, I don't think your outfit is hot. 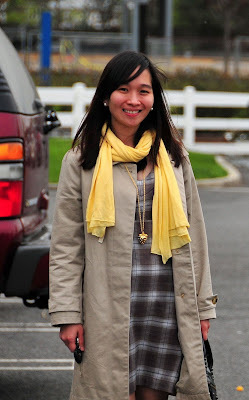 the yellow scarf throws the outfit off course. I would have chosen a scarf that complimented the dress. nice try! as for the bag, I can't make it out..therefore no comment. Hi there! Im such a fan of ur blog. Im based in Shanghai with my family, but right now im in Manila to assist my eldset as he enters college in UP. I love the GAP coat ur wearing! and the honestly without a blink, the yellow scraf is just adorable. Its carefree .Its FUN. We should have more FUN in our outfits, dont you think? So, where can i score the GAP coat ur wearing? if ur OK to share it with me? I've also seen export overruns from Gap, Banana Rep & J. Crew in Greenhills (the tiangge section) and at bazaars like Karl Edwards so you can also look for coats there! My friend got a really cute J. Crew wool coat for less than P2000 in Greenhills. Best of all, it was current season, and retailed for over $200!